What Is The World of Difference? Walking into each Saddleworld store is a unique experience - some stores focus on english disciplines while others cater more for the campdrafting or western rider. At Saddleworld stores we have a diverse range of products throughout our store network. We also have a selection of strong prominent inhouse brands. The unity between our Saddleworld stores comes from the belief every rider in Australia deserves to achieve their dream. We have experienced staff who are knowledgeable and want to see you succeed. The Next Chapter Megan Jones’ next goals in riding and the next chapter. Making Choosing The Right Rug Easy Choosing the right rug for the Autumn & Winter. Why Do You Need A NEW Helmet? Learn about the importance of the right helmet. Suppleness & Fitness Exercises for Your Horse Kohnke’s Own explore exercises, science of fitness and good nutrition. WHY PURCHASE AT YOUR LOCAL SADDLEWORLD? Cover: Eurohunter Neck Rug Page 48 & Grainge Leather Halter Page 45. EDITORâ&#x20AC;&#x2122;S LETTER IT'S AUTUMN! THE WARM WEATHER IS BEHIND US NOW AND IT'S TIME TO RUG UP. 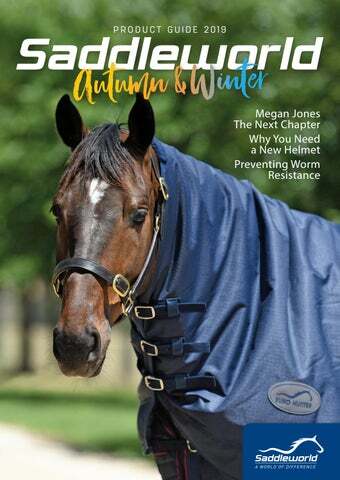 Welcome to our Saddleworld Product Guide Autumn & Winter, 2019 Edition. It's a great time to focus on your horse's health. We have a huge range of health items to find out about in this edition, from worming with Virbac to nutrition with Kohnke's Own. X-Technology allows more refined panels bringing the rider into closer contact with the horse, in the most favourable way. Elastic membranes support the riders seat bones, offering unparalleled contouring to the ridersâ&#x20AC;&#x2122; anatomy to alleviate pressure on seat bones. The Prestige Tree, was purpose designed to provide the same elasticity as a tree made of wood, while at the same time, eliminating the negative attributes associated with a wooden tree. Ever committed to ongoing product development, Prestige Italia offers advanced leather finishes in tobacco or black. LUX leather has the softness of calfskin leather but with increased durability for Australian conditions. Panels flocked with a special synthetic fibre that prevents compression of the material and therefore requires less maintenance. They also offer more options: Panels +1 cm/+2 cm at the back or with half stuffing. BOOK A SADDLE FITTING Visit saddleworld.com.au to find your local store. ONLINE FLIPPING BOOK BE SURE TO CHECK OUT THIS PRODUCT GUIDE ONLINE AS WELL! Product Guide Pricing Policy: Disclaimer: The information and advice provided within this publication is general advice only. Saddleworld does not necessarily endorse views and claims expressed by advertisers in this publication and online links. Saddleworld takes no responsibility for the outcome of any action taken by readers or others based on the information contained within. Pricing: All prices were correct at the time of printing. Prices shown are recommended retail prices only and inclusive of GST. We try very hard to hold our prices throughout the life of this product guide, however occasionally this is not possible. Whatever changes are forced upon us, you have our absolute guarantee that we will always offer you the best possible prices. Product Description: Saddleworld takes every care to ensure the descriptions and specifications of the goods we offer throughout this guide are correct at the time our product guide is printed. Colour representation is as accurate as possible however variations may occur. All products have been included in this Product Guide on the basis that the goods, as described, will be available. Failure by a supplier to deliver according to the sample, description, or at all, may result in some lines being unavailable. We have made every effort to ensure that all information in this catalogue was true and correct at the time of printing. We reserve the right to correct any printing errors at any time without notice. Actual product colours may vary from the colours shown. Some items, styles, colours and sizes may not be available at all stores but may be ordered in while stocks last. 12 FEATURES 10. Discover the Prestige Italia Difference Find out about the history and process of making saddles at Prestige Italia. 12. The Next Chapter Megan Jones' next chapter in life. 16. Trust, Partnership & Practice Sarah Corr, Saddleworld Ambassador of the Year. Eurohunter has a rug for your horse! Caring for your horse in cooler months. Find a rug for your dog. Learn about worm resistance and preventing it. The NEW Eurohunter Zip Paddock Boot. 60. Why Do You Need a NEW Helmet? Learn about helmet safety. 64. Find the Brush you need this Autumn & Winter Find the ideal brush for your needs. 18. Why Choose the PDS Carl Hester Collection Learn more about the saddle Collection. 20. The Game Changer Susan Elekessy talks about her PDS success. 20. More than a Dressage Solution The PDS performs in the show ring again. 22. What Riders Say about Pessoa We asked for public opinion about Pessoa. 27. Fitting Your Horse's Conformation Find out which Thorowgood saddle may fit your horse. 37. What Girth Should I Select? Finding the right girth for your horse. An exercise about suppleness,science behind physical fitness & positive benefits of good nutrition. 19 SADDLES 14. Prestige Jumping Saddles View jumping saddles from Prestige Italia. 15. Prestige Dressage Saddles Find out about the variety of dressage saddles. 21. PDS Carl Hester Collection The PDS Carl Hester Collection saddles. 23. Express Your Personality Pessoa can express your personality. 24. Pick Your Style with Pessoa View the range of Pessoa available. 26. The Perfect First Saddle Thorowgood is the ideal first saddle for riders. 28. Thorowgood T4 The Thorowgood T4 range of saddles. Finding the right Thorowgood T8 for you. 30. Trainer's Saddles The Trainer's saddle range. 32. Ammo The saddle made for Australia. 36 TACK 35. Saddle Pads The saddle pads available at Saddleworld. 36. Girths Pick the right girth for your horse. 38. Horse Boots Traveling or riding find horse boots. 39. Stirrup Leathers Find stirrup leathers at Saddleworld. 40. Stirrups The ideal stirrups for your discipline. 41. Ellipse New generation of stirrup. 42. Bridleware Choose the right bridle for your horse. 44. Halters & Leads Halters and leads available at Saddleworld. Read all about the Eurohunter rug range. Find out about our stable rugs. 53. Eurohunter Canvas Rugs Need a canvas rug for in between weather. 53. Eurohunter Sheet Rugs The ideal under rug. 46. Whips A selection of whips. 55. The Only Paddock Boot You Need Find out about the NEW Eurohunter Paddock Boot. 56. Grazioli Boots Quality long boots made in Italy. Performance footwear focused on technology & innovation. 58. Pikeur-Eskadron Fashionable items for both rider and horse. 59. Sunbody Hats Authentic, practical and sun-safe. 59. ELT Clothing for cooler months. 60. Troxel Performance headgear, low profile schooling helmet. 61. Safety & Style at Saddleworld NEW Eurohunter Renmark Helmet. 73. The Development of Worm Resistance Learn about worm resistance and preventing it. 74. Vetsense Quality assured animal health products. 75. TuffRock Supporting nature's balance. 75. Jurox Australia's animal health company. 76. Kentucky Equine Research World leaders in equine nutrition. 78. Suppleness & Fitness Exercises for Your Horse An exercise about suppleness, science behind physical fitness & positive benefits of good nutrition. 62. Stable Solutions at Saddleworld Stock your stable with items from Saddleworld. 79. Kohnke's Own Essential range for health and performance. 70. Minrosa Items to improve your riding. 70. NRG Get ready for winter horse health with NRG. Feed buckets and much more! Leading the way in strategic worming. Find the ideal brush for your needs. 65. Oster Professional clippers, the brand you know. The quality you trust. 66. Equinade Animal & Leather Care Products. 67. Sabco Cleaning items for your stable, truck & float. 68. Ferrari Innovations Items to improve your riding. 69. Horse Treatments Helping your horse heal. 69. Tubbease Making hoof tubbing easy. 69. Arcequine The complete pain management and tissue repair system. WORLD’S MOST POPULAR BRANDS OF SADDLE IN ITALY? INNOVATION IS THE ANSWER AND IT’S IN THEIR DNA. crafted rawhide that wraps around the back of the saddle seat - to protect from bumps and abrasions. frame constructed using a composition of nylon and glass fibre. technological innovation. Prestige Italia utilises various technology including X-Technology and X-Breath. Today Prestige Italia is as true to its beginnings as it has ever been. Visit your local Saddleworld store today to sit in a Prestige Italia saddle. A perfect fit is a thing of beauty. X-Breath K, Cross Country saddle, medium deep seat. her towards the next goal of the Tokyo Olympic Games 2020. EQUESTRIAN GAMES AND COUNTLESS AUSTRALIAN COMPETITIONS. immediate plans relate to her new baby son Finnley. “captivated, hooked and focused,” Megan says. desire to win an Olympic medal since she was ten years old. were not, a zoo operator would have been her calling. The Prestige X-Advanced is a single flap saddle designed and devised for Cross Country riding. The saddle offers the rider maximum freedom of movement throughout the entire time they are airborne when jumping. The cantle is never a bother to rider when they return to the ground. The saddle offers an excellent contact between rider and horse thanks to its narrow twist. The front rolls are anatomically shaped and located on the panels, providing riders with ideal support and the maximum safety. We placed Damask leather inserts on the rear part, on the stirrup leather keeper on the flaps, and on the panels’ channel, giving the product a unique and charming look. Prestige Paris Classic Featuring X-Technology Panels, but with a traditional tree (no membranes), the more refined panels bring the rider into closer contact with the horse. Prestige Passion Jump A show stopper, featuring a medium deep seat, with medium knee and thigh blocks. Bovine Leather Perfect for everyday jumping and everyday riding. Prestige Passion Jump K The close contact saddle of their series, a medium deep seat with a square cantle in a monoflap. See Page 17-18 for full details on the Prestige X-Technology. X-Breath Dressage The striking feature of this product is the large opening in the seat. It is an oval hole located in the centre of the seat with the aim to both guarantee ventilation, resulting in a better air circulation, so cooling both horse and rider; and to promote the health of the rider, as the opening is anatomically shaped to relieve pressure on the coccyx. The opening is covered with a special ultra elastic 3D material that increases the comfort of the seat. The saddle presents holes and openings on flaps and under flaps with the aim to lighten and improve ventilation. The rear girth straps come in the shape of a “V” for more balance on the back of the horse. X-Prestige Helen K A great saddle, easy to fit multiple horses with a narrow twist allowing rider to be balanced over the stirrups. Prestige X-D2 K A deeper seat bringing rider and horse closer without movement restrictions plus anatomically designed panels for maximum movement of the trapezius. Prestige Passion Dressage K The ultimate close contact feel with external knee blocks for stability plus the elegant contrast stitching is unique. I love spending the time with my horses developing their potential and seeing them try really hard for you as young horses and carry that through into confident star horses. Why choose the PDS Carl Hester Collection? Perfect union between horse and rider. Rider and horse immediately feel as one. Carbon fibre unbreakable tree. Speciality foam and flock panel for maximum comfort and weight distribution. Maximum adjustability on site through an adjustable tree and flocked panel design. Anatomically designed knee blocks to support riders, encouraging them to lengthen their thigh. Premium quality double stitched calf leather. All saddles feature identical girthing options without point straps, allowing maximum freedom of movement through the shoulder. NEW Delicato Monoflap What makes it different? The PDS Delicato is very similar to the PDS Valegro, the main difference is the cantle. The cantle has been crafted in a more rounded shape. The saddle has also been created for a wider shaped horse. The PDS Delicato is a beautiful edition to the PDS Carl Hester Collection. The saddle brings the rider’s lower leg closer to the horse as the saddle does not have a front gusset. The saddle is crafted for those with narrow hips without compromising comfort for the horse. As with all PDS Carl Hester Collection saddles the soft panelling creates very close contact and absorbs the movement of the horse. “In actual fact Delicato himself has a very wide rib cage, it was very difficult especially because I’m quite narrow to actually feel that I could sit comfortably on him. This saddle immediately had the effect of bringing me closer to the horse which is very important,” Carl Hester MBE. PDS Valegro Mono Flap This saddle has a deep seat for rider stability and comfort while featuring AMS Panels for horse comfort. PDS Entrada Mono Flap A deep seat for rider stability, durable single leather and an unbelievable price. PDS Grande Mono Flap The ultimate for close contact, whether it is rider preference or necessity on a wider horse. PDS Euro Pro Achieve superior control and balance with exceptional freedom of movement for your horse. PDS Integro The PDS Integro is suited to horses with a low wither, flatter back and barrel shaped rib cage. Visit saddleworld.com.au to find your local store. The leather is very good quality, I find the Pessoa XP3 very supportive for all aspects of jumping and especially when galloping in the cross country phase. The Pessoa XP3 helps to stabilise the lower leg with the supportive knee rolls, Stacey Halstead I just love using my Pessoa XP3! The Pessoa Tomboy jumping saddle ticks all the boxes for me. With the adjustable gullet it is suitable for many different models of horses and can be altered as your horse develops. Beautifully crafted leather and with the unique stitching on the top flap it is a stunning saddle visually but more importantly helps to create the best possible position for the rider. The leather moulds beautifully with the riders Sue Coman leg and the adjustable blocks can be adapted to each rider individually. •	Seats 16.0” to 18.0” (1/2” increments). •	4 flap options: Regular, Forward, Long and Long Forward. •	3 panel options: Standard, Corto and Alto. •	7 tree widths with X-Change® System: N to XXXW. •	AMS® Panel System allows saddle to be re-stuffed and re-shaped when necessary. Pick Your Style Pessoa Gen-X Pro The Pessoa Gen-X Pro combines all the best features of the very popular Gen-X series, and adds cushion-lined flaps with durable wear guards. With modern decorative stitching, and an ultra close contact moulded knee roll. This saddle is the perfect blend of high performance and functionality. Pessoa Legacy XP3 Exclusive grained leather with a natural finish, provides increased durability and extraordinary grip. These characteristics make the Pessoa Legacy XP3 a premium saddle. Years of demanding testing have produced a jumping saddle that is designed with competition in mind and delivers on the needs of professional riders. Pessoa World Champion Offering the deepest seat in the range with the extra grip of double leather, a secure seatand immediate comfort. The Perfect First Saddle The Thorowgood range caters for the younger rider when looking for a saddle that is comfortable for both pony and rider. The Thorowgood Pony saddles help develop a balanced and independent seat with short panels crafted for ponies. tThorowgood T4 Pony This all-round saddle helps the young rider develop a balanced and independent seat. It is available in 4 seat sizes, scaled to accommodate the very young child on their first pony, through to the more active teenager or petite adult rider. Plus a longer flap option is in the 16” and 16½” models to accommodate the rider with a longer leg. Luxurious suede-effect seat covering and knee pads are non-slip and really comfortable to ride on. Fitting Your Horse’s Conformation It’s important to find a saddle that suits your horse’s conformation to ensure they are comfortable. THAT’S WHY THOROWGOOD IS THE SADDLE YOUR HORSE WOULD CHOOSE. KEY CONCERNS RELATED TO DIFFERENT BREEDS/TYPES OF HORSE Saddle stability and minimising bulk between horse and rider. Low withered, flat backed and big barreled. Slim-line rear and front gussets give a low profile fit. Medium wither and average build. Standard depth gussets provide a balanced fit. Prominent wither and slender bodied. Deep front and rear gussets ensure good wither clearance. Relatively easy to fit but bearing surfaces should be maximised. KEY CONCERNS RELATED TO DIFFERENT BREEDS/TYPES OF HORSE Clearance of the spine without pinching and saddle balance. Thorowgood T4 General Purpose Cob Best all-round saddle for the rounder Cob-type horse. Offers close contact to avoid that ‘perched-on-top’ feeling. Versatile medium depth seat is ideal for a range of riding activities. Thorowgood T4 Dressage A customisable fit with large moveable block to train your leg into a longer position. Thorowgood T4 Original GP High Wither A roomy seat, relatively deep rear gussets and the tree has a slight curvature. Great for horses with an apex shaped back. Tailored for high-withered horses,with tree and panels specially shaped to give maximum wither clearance. Thorowgood T4 Compact GP High Wither A slightly flatter tree and compact panels that allow the rider to feel closer to the horse, while deep enough to ensure maxiumum clearance high-wither conformation, petite riders or those with narrower hips may feel it suits them better. Thorowgood T4 Dressage High Wither A dressage specific tree and moveable under-flap thigh blocks to help rider maintain a balanced dressage position. The deeper gusseted panel ensures maximum clearance along the spine. Thorowgood T4 General Purpose If your horse is neither low or high-withered, more of a medium withered shape, middleweight horse this is your saddle. Thorowgood T4 Dressage Cob Tailor-made to allow the broader horse to work in comfort.3 different girthing options ensure total saddle security. Close-contact panels enable the clear transmission of leg aids, making this the best solution for the low withered horse doing flatwork. Thorowgood T8 GP Cob Best all-round saddle for the low withered Cob-type horse. Offers close contact to avoid that ‘perched on top’ feeling. Versatile, medium depth seat is ideal for a range of riding activities. Thorowgood T8 Dressage Low Profile Tailor-made to allow the broader horse to work in comfort, the low profile panels offer closer rider contact, making this the best solution for the low withered horse doing flatwork. Thorowgood T8 Dressage (Surface Block Available) All the benefits of the Thorowgood customisable fit plus a leather seat, skirt and knee pads. Thorowgood T8 Endurance Crafted for comfort, made with short panels for short backed Arab types and straighter cut flap for leg comfort. Thorowgood T8 Dressage High Wither (Surface Block Available) Dressage specific tree and moveable under-flap thigh block to help the rider maintain a balanced dressage position. The deeper gusseted panel ensures clearance along the length of the spine. Thorowgood T8 Compact GP High Wither A slightly flatter tree and compact panels that allow the rider to feel closer to the horse, with clearance for high-wither conformation, petite riders or those with narrower hips may feel it suits them better. Thorowgood T8 High Wither GP A saddle suitable for a little bit of everything for the high withered horse. The quality seat and knee pads give the feeling of riding on an all-leather saddle. Trainer’s Jessica Deluxe The Trainer’s Jessica Deluxe is a closer contact mono flap saddle, allowing you to feel at one with your horse. The beautiful craftsmanship of the saddle is second to none and is at home in either the dressage arena or at a show. Trainer’s Jessica Pro With a moulded flap for greater contact in conjunction with the deep seat creates comfort and balance. Trainer’s Royal Show The Trainer’s Royal Show is classically designed show saddle featuring the finest quality Sedgwick leather. As to be expected the buttons are leather covered and the saddle features fully stitched flaps with pencil knee blocks. Have you been wondering what makes the Ammo saddle exclusively from Saddleworld different to all the other stock saddles available in Australia? It’s where the fenders are placed! The position of the fenders is directly underneath the rider, this provides unparalleled balance for the rider whether trail riding or campdrafting. The Ammo Leather Great for general riding, built on a lightweight tree with quality leather and made in Australia! The Ammo Pro A comfortable saddle for everyday riding, plus easy care and durable synthetic perfect for winter. Also Available in Plaited Version. Ride proud on our finest saddle Traditional Australian seamed-in seat. Versatile 3-way rigging plates + flank dee. Edge-dyed, edge-sewn saddle flap leather. Find the right tack items to suit horse and rider at Saddleworld. Whether itâ&#x20AC;&#x2122;s a saddle pad or a halter we have the products you need. Saddle Pads Grainge Golden Fleece The Grainge Golden Fleece Merino Wool Collection is a performance range of products utilising Southern Australian Merino Wool. PDS Saddle Pad Quality cotton with premium contrast binding and shaped wither. Itâ&#x20AC;&#x2122;s important to select the correct girth as this impacts on safety and comfort for your horse. A girth can be crafted from many different materials. Leather Girths: A traditional style and are great for coordinating with the colour of your saddle. Synthetic Girths: Easy to care for, affordable and durable they are a great option. Neoprene: The softness and flexibility of the material is great for the sensitive horse. Note some horses are allergic to this. Deluxe Gel: A synthetic girth with a gel centre is for added horse comfort. Eurohunter Freedom Girth Ultimate in equine comfort, this supple leather girth is designed for maximum freedom of movement. Eurohunter Anti-Gall Elastic Girth Lonsdale anti-gall, elastic one end and stainless steel roller buckles. Eurohunter Anti-Gall Tubular Girth Hardwearing, practical and easily maintained girth. Eurohunter Deluxe Gel Anti-Gall Girth Gel centre and elastic both ends to help give your horse the care it needs when working. Prolite Girth Scientifically proven to increase horse movement. Sheepskin cover also available. Stirrup Leathers Be sure to check your stirrup leathers regularly for wear, it’s important to keep these in great condition for your safety. All leather stirrup leathers need to be treated with leather care items from quality suppliers such as Oakwood or Equinade to stay in the best condition. What Size Stirrup Iron do I need? It’s vitally important to purchase stirrup irons that are not too small or much too large. The irons should be about one inch (1.25cm) wider than your boot so place the ball of your foot in the middle of the stirrup and see if there is about half an inch each side. Prestige MG Stirrups Made from magnesium, with optional interchangable 650g heavy or 400g light metal treads. Prestige Silk Stirrups Light polyamide material with an interchangeable summer/winter base plate. Grainge Oval Stirrup Irons Specially designed stainless steel stirrup iron that is wider and more elegant. Grainge Fillis Stirrup Irons Stainless Steel, complete with white rubber treads. E L L I P S E NEW GENERATION OF STIRRUPS POSITIONING Interchangeable eyelets Two types of interchangeable eyelets provided for traditional or perpendicular positioning. PA S S I V E S A F E T Y No weak point Stainless steel flexible arch that complies with tensile and fatigue tests certified by an approved centre. ACTIVE SAFETY Flexible branch The foot can be released in the event of a fall. Available in two versions SPIKED+ with spikes COMFORT+ with elastomer sole. COLOUR Choose your style Available in Red, Blue, Silver and Black . Zilco International Pty Ltd: [t] 02 8765 9999 | [e] sales@zilco.com.au | [w] www.zilco.net Available from Saddleworld stores across Australia. Since 1872 Sprenger has set new standards in the production of Bits, Stirrups and Spurs. The Unique combination of collaboration with professionals in the ďŹ elds of sports, medecine, design and research, quality made in Germany, decades of experience and great market knowledge is what makes Sprenger the leading manufacturer. Halters & Leads The must have, every day item that horse owners must purchase is the halter. Whether you are looking for a quality leather halter or a training rope halter, Saddleworld has a wide range of options available with just a selection of the products across these pages and much more in store. G: Fleck Lunge Whip A great training partner, wrapped sticky grip, woven nylon cover and lash. Sizes: 180cm or 200cm. Code: FK05672XX. Why Use A Pessoa Training System? For the development of back muscles. Using the Pessoa Training Aid, the back muscles are encouraged to work firstly in the low position, developing muscle at the base of the neck, and subsequently in the high position, whichis similar to that of a ridden horse. Balance Used correctly, it can be an excellent tool for helping horses to find their own balance. When cantering, the Pessoa Training Aid encourages the horse to take the weight off the forehand and bring their hindquarters underneath them, thus improving their balance. Making Choosing The Right Rug Easy It’s important to consider rugging in the cooler months for your horse’s health and well-being. When choosing a rug it’s important to pick the right style and size to ensure your horse is comfortable and protected from the weather. The Eurohunter Rug collection is created with fabric and fibre designed for us - what’s best for you is also for your horse. We utilise natural fibres including cotton and wool which increases the breathability of the rugs and overall comfort of your horse. Plus we use a waterproof and breathable membrane of the most advanced technology for peace of mind. The Eurohunter icons have been created to take away the dilemma of purchasing the right rug for your horse. We have given our rugs a warmth rating between 1 and 5 with 5 being the warmest. Resistant to tearing and damage. The weight of the Polyester fibre fill measured in grams.The higher the number the warmer the rug. Indicates maximum water resistance of outer material. The higher the denier rating of the outer shell fabric, the thicker and tougher the fibre is within the fabric. Durable water repellency, stain and soil protector. Water resistant outer material. The fabric is breathable allowing air flow through the fabric. Fully taped seams prevent water from leaking through. DuPont Teflon® fabric protection, repel and release technology. Fends off stains, soil and rain. 5000 SERIES Eurohunter 5000 Series Next generation design incorporated with the exclusive Aquabreathe 5000 waterproof breathable technology. Eurohunter 3000 Series Bred to survive with rugged durability and exclusive Aquabreathe 3000 waterproof breathable technology. Aquabreathe waterproof breathable technology. Allows moisture vapour to escape whilst repelling rain and wind. Don’t Forget Your Dog This Season Your dog may need a rug just as much as your horse! The Eurohunter range of dog rugs allows you to choose the ideal rug for your best friend. The Eurohunter 5000 Ultra Dog Rug is our warmest dog rug, with the same 1680 Denier Oxford Ballistic shell as our Eurohunter 5000 Ultra you know you won’t be compromising your dog’s warmth. The rug is filled with 200gm polyfill and soft cotton lining. The Eurohunter Bluey has a lighter outer shell of 600 Denier and still the same 200gm polyfill to keep your dog warm. The cotton lining ensures your dog is comfortable in their Eurohunter rug. The warmest rug in our collection is the Eurohunter 5000 Ultra it has been crafted to handle the coldest conditions, if it’s really cold this is the rug you need. The outer of the rug is constructed with 1680 Denier Oxford polyester ballistic shell to protect your horse from the harshest elements. The exterior is further enhanced with Teflon to repel water off the surface of the rug. The fabric has been designed to allow your horse’s body to breathe. Plus the tail flap is designed to be oversized to provide complete weather protection.To keep your horse warm the rug is insulated with 250gm polyfill and the lining is fleece for added comfort. The rug is also fitted with safety reflective piping so you can spot your horse at night. •	1680 Denier Oxford polyester ballistic shell. • Teflon® coated outer to repel water off the outer fabric. •	250gm polyfill with polyester fleece lining. •	Aqua Breathe 5000 waterproof breathable technology for sustained weatherproof performance, long after others have failed. Eurohunter 3000 Blueline A great between seasons rug, ideal for blocking cold wind. The fabric is eye catching and the safety piping is fitted for extra safety. The Eurohunter 3000 Blueline is perfect for when the days are cool and the nights even colder. • 1680 Denier Polyester Dobby Ripstop. • Teflon® coated outer to repel water off the outer fabric. • 270gm polyester fleece lining. • Triple-D front closure system. • Safety reflective piping. Eurohunter 3000 Rainsheet The perfect rug option for when it’s pouring rain and you want to keep your horse dry without added warmth. The Eurohunter 3000 Rainsheet is mesh lined with no fill and the 600 denier shell will keep the rain away. • 600 Denier Polyester Oxford Ripstop shell. • Mesh lining no fill. • Safety reflective piping. wool blend rug. •	Lightweight • Perfect as an under rug or light stable rug. • Leg straps for stability. The ideal choice for mid-season rugging is canvas because of its natural ventilation! Eurohunter Gladiator Deluxe A thick woollen lining to keep your horse warm in a canvas rug. Need a Sheet for Warmer Days? It’s a great idea to use a sheet underneath a synthetic or canvas rug as these can be easily changed and washed to keep the outer rug cleaner. Rider Boots Saddleworld caters to a range of riding disciplines whether riding english or western, we have a great range of boots to suit riders. Why a Paddock Boot? is comfortable, easy to put on with the zip and the outsole is harder wearing The design of the boot allows you to be stylish - whether riding, mucking out stalls or just everyday use. The Eurohunter Zip Paddock Boot is the ideal boot. Try on a pair at your local Saddleworld store today. than a traditional jodhpur boot. G R A ZI O LI BO OT S GRAZIOLI BOOTS ARE MADE IN ITALY FOLLOWING TRADITIONAL METHODS AND USING ONLY THE HIGHEST QUALITY MATERIALS FROM THE FINEST GRAIN CALF HIDES, LEATHER LINING, LEATHER FOOT-STRAP, ALL IN ORDER TO ASSURE COMFORT AND ELEGANCE. Grazioli boots feature DNS-XT1 Technology for absorbing shock and providing greater support. Improved performance results in increased comfort, stability and resistance. DNS-XT1 guarantees durability, reliability and superior traction for a higher level of performance. The lightweight, flexible DNS-XT1 sole reduces fatigue in the feet, legs and back in both Field and Top Boot Styles. Sunbody hats are authentic, practical and sun-safe. Handmade from Guatemalan palm leaves, the hats are pressed in heated moulds to hold their stylish shape. Sunbody’s palm leaf hats block out both UV-A and UV-B rays and are certified to use the highest protective rating of UPF 50. Helmets Why Do You Need a NEW Helmet? Saddleworld is dedicated to supporting all Australian equestrians with quality products to chase their dreams. Our commitment to safety with our helmets is no different, we want every rider to enjoy a safe and wonderful experience when riding. We strongly believe in the use of helmets as too many lives are impacted on due to this simple but crucial safety measure being overlooked. Did you know? Your helmet must fit correctly (not too loose or too tight) and the chin strap fastened to provide protection. Helmets need replacing every 5 years. Even after a minor fall/accident it is recommended you purchase a new helmet. Helmet damage is not always visible, it’s better to be safe than sorry. Make sure your helmet is approved under the current safety standards. Safety & Style at Saddleworld A new design to compliment the rider while maintaining safety. The Eurohunter Renmark is flattering and comfortable for the rider. A lovely defining stitch has been used on either side of the ventilation for a classic look. The visor protects your face from weather elements, try one on at your local Saddleworld store today. INTERNAL LINING The internal lining of the helmet can be easily removed and washed. VISOR A visor is fitted at the front of the helmet to help protect from the weather elements. VENTILATION The helmet is fitted with ventilation for air flow. APPROVED SAFETY STANDARD PAS 015:2011, VG1 01.040 2014-12. Eurohunter Renmark Helmet Colours: Black or Navy Sizes: 52 - 61 Code: EH81004XXX Approved Safety Standard PAS 015:2011, VG1 01.040 2014-12. $99.95 Eurohunter Renmark Diamantes Helmet Colours: Black or Navy Sizes: 52 - 61 Code: EH81004DXXX Approved Safety Standard PAS 015:2011, VG1 01.040 2014-12. Academy Jute Bale Carrier No Mess! Ideal for taking hay to competitions or for picking up that odd bale in the boot of your car. Strong jute with velcro closures and web handles. Eurohunter Grooming Box Keep your horse sparkling with these fabulous grooming boxes. Includes a full range of everyday grooming equipment for coat, mane and hoof care. Stable Fork Sturdy metal tine stable fork with timber handle. Your Horse Deserves the Best! THE BEGINNING OF A NEW ERA What is happening to the company? Instead of having numerous logos and brands under the companyof Faulks & Cox Ltd, we will have everything under one brand - Red Gorilla™. Why is the transition taking place? Creating one brand identity that communicates both strength and quality across our range, makes our business streamlined. Brand and tone consistency is imperative to engaging and ‘connecting’ with consumers, resulting in more sales. When will this all be happening January 2018 will be the “totally live” date when everything has changed to Red Gorilla™. Throughout 2017 we will continually be educating and informing all stakeholders in the supply chain (including consumers) of the changeover. How will this benefit me and my customers? Largeunderstand Shallow 35L Small Shallow 15L Shallow 5L one Customers will all of the products in the rangeXSare from Code: TUBT14X trusted brand, Code: TUBT35X Code: TUBT15X Code: TUBT5X giving them the opportunity to buy across the range, delivering multiple purchases to you. Eurohunter Classic Goat Hair Body Brush The natural goat hair brush is soft and an ideal finishing brush to really polish the coat. Why Clip Your Horse? Clipping your horse may be a great option in winter for the horse in work. A shorter coat will dry faster after exercise preventing the horse from becoming too cold if the long coat remains damp. Plus it makes grooming much easier! If you choose to clip your horse be sure to adequately rug to make up for the lost coat. The brand you know. The quality you trust. The OsterÂŽ name brings the best in performance and comfort. This trimmer is designed for light duty on pets. Quiet rotary motor for calm clips, has a turbo motor which allows use for 2 speed power boost for heavier coats. Runs at 5,400 rpm. Rechargeable, cord or cordless operation for flexibility & freedom. Normal speed for precise clipping around the face High speed is faster and is designed for fast body clipping. Oster Clipmaster Big, powerful and well tried and tested on the worldwide market for over 30 years. Ideally suited for larger stables and yards, this clipper has a 150 watt motor. It can tackle clipping through any hair type. It is equally at home clipping cattle and horses. Now Available ask instore for details! LEATHER CARE COMPLETE LEATHER CARE SYSTEM Oakwood’s Complete Leather Care System will keep your riding gear in great condition. Our system is made with quality ingredients and has been specifically designed to target the three essential areas of leather care: Clean, Condition and Maintain. 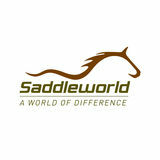 Find Oakwood at your local Saddleworld Store! Ferrari Dressage Arena Made to EFI standards and safety requirements. Suitable for 50mm pipe, wooden poles or chain (NOT included). Easy to stack and store. Ferrari Jumpstart Jumping system that creates 6 different heights. Safe for horse and rider. No sharp edges. Nylon Pro Pack Includes: 4 x 500mm tracks, 4 cups and flag set. Ferrari Stackable Cavaletti The Block is 12.5 cm high,add another Block and raise the Cavaletti 7cm. Ferrari Plastic Poles 3 x 1 metre poles Ferrari Safety Breakaway Cup Fibre reinforced Nylon jump cups that falls away from adapter under pressure. Fit standard Keyhole tracking. Can be reversed for planks. Made to FEI standards. Horse Treatments Horses sometimes have accidents. Whether it's a small injury or something bigger, once a vet has been consulted Saddleworld can help provide treatment solutions. If you are after something to help hoof ailments or more tissue repair Saddleworld has a great range of items to get your horse back into great health. 1. Just like people, horses burn calories keeping warm so it’s important to ensure your horse has lots of feed, remember winter pasture does not always contain enough nutrients. 2. Your horse needs to be given the best chance to thrive in cooler months and this is where a horse dentist is vital. 3. Horses may also need extra hydration due to the lack of moisture in hay which may be fed as roughage. 4. A great fitting quality rug such as our Eurohunter range is also important to maintain condition on your horse as body fat can be lost through trying to keep warm. 5. Along with a great rug don’t forget the importance of shelter from the harsh autumn and winter weather. 6. Before you ride always take a little extra time to warm up your horse to avoid injuries, horses are just like humans in winter. 7. Hoof care is really important in the colder months for horses as the extra moisture from winter rain can cause bacterial infections. 8. The mud is terrible in cooler months and it’s important to ensure your horse can escape it. THE VIRBAC GOLD STANDARD Virbac is leading the way in strategic worming programs for horses. Our Gold Standard program combines trusted solutions from Virbac and our unique ‘3D’ best management practices to deliver premium and sustainable worm control. The strategic use of Strategy-T, Equimax Elevation and Equimax provides a comprehensive worming solution for horses of all ages. For more information, visit au.virbac.com or contact Virbac Customer Support on 1800 242 100. ®Equimax and Strategy-T are registered trademarks of Virbac. If some worms survive the treatment they may be resistant to the chosen wormer. Those worms reproduce resulting in pasture contamination with resistant worms. The horse eats a mixture of resistant and susceptible worms. With continual treatment with the same family of wormer the numbers of resistant worms will increase. WHAT IS RESISTANCE? RESISTANCE IS THE ABILITY OF WORMS IN A POPULATION TO SURVIVE TREATMENTS THAT HAVE GENERALLY BEEN EFFECTIVE AGAINST THE SAME SPECIES AND STAGE OF INFECTION. When worms develop resistance to one type of wormer they are normally found to be resistant to other wormers of the same type or family. For example, if worms became resistant to moxidectin there is a very high likelihood that they would also be resistant to ivermectin and abamectin. FACTORS AFFECTING RESISTANCE Several factors can influence how quickly resistance to a particular anthelmintic will develop. 1. Frequency of worming treatment High frequency dosing is an important risk of selection for resistance. 2. Dosing and efficacy of treatment Under-dosing or using an ineffective anthelmintic will increase the development of resistance. 3. Refugia population (In refugia) literally means ‘taking refuge’ or ‘hiding’ and refers to the population of worms not exposed to or affected by treatment. The larger the refugia population the slower resistance will develop. 4. Overgrazing and overstocking This can contribute to an increase in the number of resistant worms on a property. Too frequent use of chemicals when not needed and underdosage of chemicals are the major ways that worm resistance to chemicals is being increased. Resistance tends to occur first in the worm species that is the hardest for a particular chemical to control e.g. roundworm resistance to mectin chemicals. Worms in refugia remain susceptible to a worming treatment. This means that the higher the proportion of worms in refugia is, the more slowly resistance will develop. To maximise refugia of susceptible worms a Gold Standard approach to worming is needed where horses that do not need treatment are not wormed as frequently. To do this faecal egg count testing is required. Pasture management practices can have an impact on this as well, for example if grass is scarce or paddocks are overstocked, horses are forced to graze close to their manure and therefore consume more larvae. In this way overgrazing and overstocking can cause a rapid increase of resistant worms in the horse. Other factors such as length of parasite lifecycle, their egg production capabilities as well as a horse’s immunity levels can influence resistance to anthelmintics. Worming too frequently will ensure only resistant worms survive, as the most susceptible worms are killed, leaving the resistant worms to reproduce. Under-dosing is most commonly caused by incorrect weight estimation, incorrect method of administration, spitting out of the product and splitting of doses between horses. Premium Hoof Formula Pellet for Hoof Health and Coat Condition BIO-BLOOM HF is a dual action supplement designed to improve skin and coat condition. Proven to increase hoof growth by 23%. It is the ideal hoof and coat conditioner for horses that need to be presented at their best for show, sale or parade. Premium Gastric & Hindgut Supplements for Digestive Health KER Neigh-Lox® Scientiﬁcally formulated blend of antacids and gastric agents for horses at risk of gastric irritation and damage. Slow and rapid-acting antacids and coating agents designed to protect sensitive stomach lining, to eﬀectively support the maintenance of a normal gastric environment. KER EquiShure® Research proven to maintain normal hindgut pH to reduce the risk of abnormal hindgut function. Encapsulation technology allows for targeted delivery to the hindgut. Recommended by veterinarians and horse owners worldwide. Joint Health Premium Joint Supplements to Proactively Protect Your Horse’s Joints KER Glucos-A-Flex® Palatable powder containing a blend of glucosamine and organic minerals to support cartilage, connective tissue, joint health and function. KER Synovate HA® Research proven oral liquid Hyaluronic Acid (HA) supplement, that matches the known attributes of HA naturally found in the horse’s body, contributing to cartilage health, elasticity and joint lubrication to improve shock absorption. KER Bio-Bloom® HF - Research Proven to Improve Hoof Health Understanding the impact of nutrition on hoof health, requires knowledge of hoof wall growth. Hoof growth is dynamic with the hoof wall constantly growing, producing new cells and re-modelling tissue from the inside out. Understanding how diﬀerent nutrients contribute to hoof growth, and how balancing and formulating diets to supply adequate levels of these nutrients, is critical in hoof care. It is important to remember that overfeeding a single nutrient can be as detrimental as underfeeding so make sure you have your current ration analysed before rushing out to by one of the many hoof care supplements on the market. Adding additional minerals to a diet that is already balanced is not going to automatically result in any dramatic increase in quality or growth of the hoof. The time required to replace the entire hoof wall from coronet band to toe is typically nine to twelve months. Hoof strength begins at a cellular level. Flexibility and strength rely on proper synthesis and organisation of proteins and lipids lying within and between the cells. Therefore, providing optimal cell nutrition is critical for building strong, functional hooves. Providing essential hoof building nutrients is important for the maintenance of healthy hooves in everyday horses, but is critical where hoof damage has occurred through injury or laminitis. Methionine is also used to synthesise cysteine; another amino acid involved in the production of keratin. Deﬁciencies of essential amino acids, especially lysine, methionine or threonine can be detrimental to the strength and integrity of the hoof. Equally, feeding excessive amounts of speciﬁc amino acids disrupts the total amino acid balance. Minerals: Remember the health of the foot is an extension of the health of the horse and if mineral deﬁciencies compromise horse health in general, then the health of the foot is going to be negatively impacted as well. The addition of any individual minerals or commercial supplements into a ration that is not meeting daily nutrient requirements, will not be as eﬀective as they would be added to a balanced diet meeting the horse’s daily requirement. Supplements that include a combination of biotin, zinc and methionine work better than just biotin or zinc alone. Protein: Protein is the main component of the hoof, making up about 93% of the hoof wall (on a dry matter basis). While protein, in the form of keratin, is the ﬁnal product; it is the individual building blocks making up keratin that are important in the diet. Biotin: Biotin plays an important role in cell to cell adhesion and therefore strengthens the hoof wall when supplied in adequate quantities. Horses which are not provided with adequate biotin in their diet, may show signs of poorer hoof wall quality, ﬂaky, chipped or brittle hooves. Methionine: One of the essential building blocks for the production of keratin and correct growth of hooves is the amino acid methionine. However, methionine is not the only important amino acid. Zinc: Zinc is involved in the health and integrity of the skin, hair and hooves. Zinc is also important in the synthesis of collagen, keratin and in intercellular cementing substance (lipoproteins) as well as immunity and antioxidant activity that protects cell membranes from damage. In the hoof wall, zinc concentration is higher than other trace minerals. Adding additional zinc to a diet that is already adequate in zinc is not going to automatically result in any dramatic increases in the quality or growth of the hoof. Organic zinc is considered more bioavailable and should be the form of choice in a hoof supplement. Zinpro Performance Minerals® organic zinc has been shown to enhance hoof growth and is the source of zinc used in KER BioBloom HF. To ensure you get the results that you need, select a research proven product such as KER Bio-Bloom HF. defects, increase tensile strength and improve the condition of the white line. Although the biotin requirement for normal horses is 1-2mg/day, studies have shown that horses with poor hoof quality supplemented with 15-20mg biotin per day have improved histological characteristics of the hoof wall tissue. Biotin can be used in the recovery from laminitis at dose rates equivalent to 45-50 mg per day. However, biotin cannot work alone and needs several other nutrients to ensure it can do its job, speciﬁcally zinc and the amino acid methionine. Figure 1: Horses fed KER Bio-Bloom HF demonstrated a 23% increase in hoof growth compared to horses not receiving KER Bio-Bloom HF. Suppleness & Fitness Exercises for Your Horse LOOKING FOR A FRESH APPROACH TO TRAINING? HELP YOUR HORSE DEVELOP BETTER FLEXIBILITY AND FITNESS USING THESE EXERCISES DESIGNED TO GIVE THE COMPETITIVE EDGE IN ANY EQUESTRIAN DISCIPLINE. Lead your horse at a walk over the poles in a figure 8 pattern, which enables the horse to twist and flex its back muscles as each leg is lifted individually over the pole (from the diagonal direction of movement). Complete the exercise unridden 4-5 times each training session as a warm up before normal ridden work. The Science behind Physical Fitness Optimal cardiovascular conditioning can be developed through step-wise training. Fitness, agility, stamina and recovery are key for competition success but increasing your horse’s training intensity too quickly can lead to problems without a sound foundation in Long Slow Distance (LSD) exercise. Background: Although many Australian horse owners recognise Dr. John Kohnke as an expert in horse nutrition, others don’t realise that he is considered an authority on equine training and management too! John has consulted with top riders and trainers regarding their horses’ physical fitness with a practical approach that has garnered great results at all training levels. Here are his top training tips! The graph explains how fitness is developed over time in performance horses. LSD training at the start of a career, or to boost fitness after a spell or down-time, helps adapt the muscles and skeletal system to withstanding increased loading forces and demand for oxygen during more challenging dressage, show-jumping, eventing or other physical training. Contact Kohnke’s Own for a copy of the exceptional LSD training program by email to info@kohnkesown.com. The Positive Benefits of Good Nutrition One of the most important factors for better training outcomes is good nutrition, a suitable diet with balanced energy sources and sensible use of supplements to help sustain performance and maximise recovery. Horses, being grazing animals, are very sensitive to nutritional balance and those in regular exercise need more nutrients than provided by grass, hay or grains. Select a range of good quality supplements tailored to what your horse needs, considering their situation, training level and discipline. One of the main causes of sub-optimal performance is poor nutrition, so don’t let the ‘feedbin’ be a limiting factor - give your horse every chance to achieve success! Suppleness: Ground Work Pole Exercises This simple pole exercise can revolutionise the flexibility of your horse, particularly in the crucial lower back region where sacroiliac pain and weakness can develop. You will see the most benefit from regular repetition, particularly in tone and build of the top-line and rump region and improved suppleness of the horse. Want more help constructing an optimal diet for your horse? Kohnke’s Own has a FREE ration design and analysis service, fully customised to your horse and your preferred feeds! Find out more on our website: www.kohnkesown.com.